I bought a new set of watercolor paints and I wanted to practice so I pulled out one of my favorite Altenew flower sets Beautiful Day. I always love to practice colouring on Altenew florals due to the size of their stamps. I started by stamping my image using Distress Ink in Old Paper and slowly building my color. Once I finished my flower I fussy cut it once it was dry (moral to this story, always by the dies...lol) I then used some accompanying foliage stamps from the Beautiful Day set along with the leaves from the Winnie and Walter In Bloom Addie's Garden set. 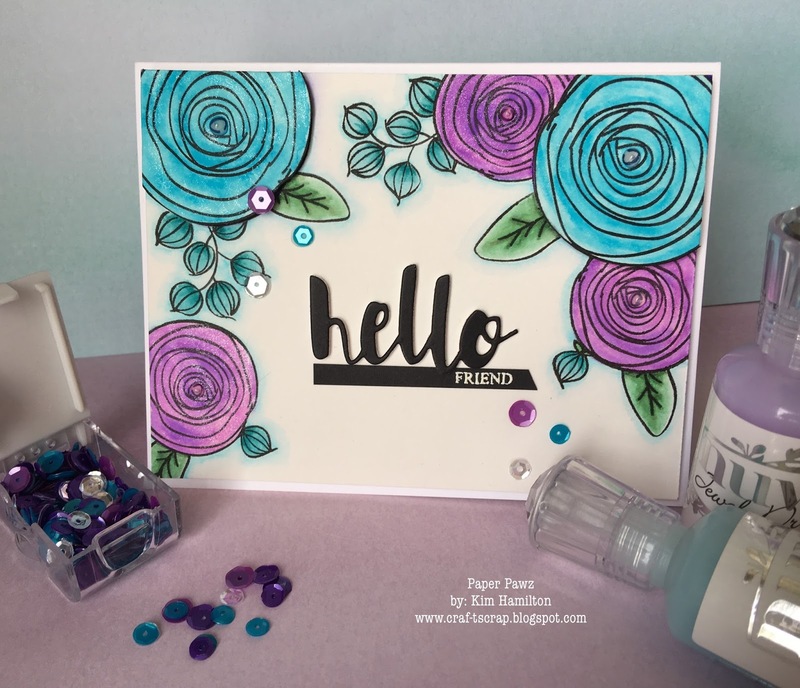 I stamped my sentiment in a mix of black and lavender inks using my Misti to mask and be able to double stamp the sections. I cut a matching card base from my Canson watercolor paper popped up my card sprinkled some Pretty Pink Posh Sparkling Clear sequins and I was done! If any of these products interest you and the stock is limited please select the notify me button, Vanessa rocks at re-stocking very quickly! Happy Friday crafty friends! 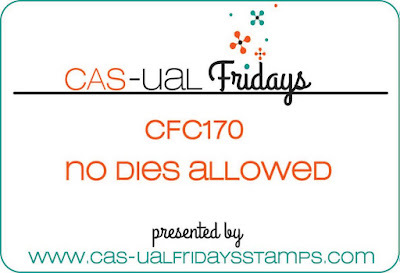 Not only is it time for another CAS-ual Friday's Challenge but I get to travel to Denver for work today and I will be meeting the owner of this wonderful stamp company!!! 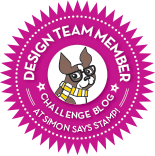 The challenge is "no dies allowed"-- I have to tell you I never realized how much I used my dies until this project! 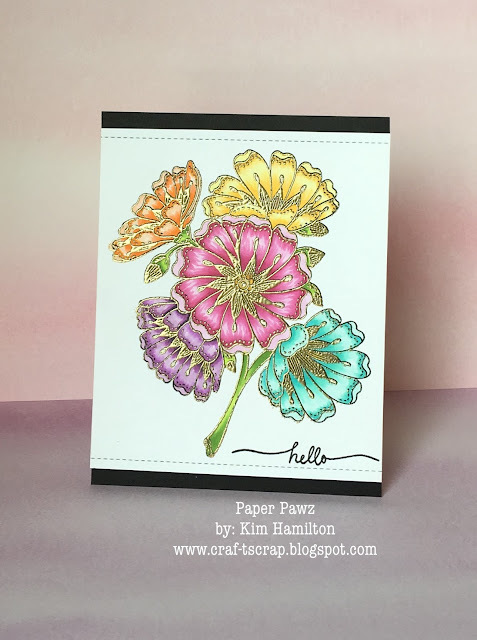 I used the Pretty Posies stamp set (they really are pretty posies) and stamped them with Distress Ink in Old Paper because I wanted to use my Prismacolor pencils and try some no-line colouring. Again, if you follow my blog you will have seen that I am trying to use colours that I don't use on a regular basis to try and stretch my palette a little. I decided to go with blues and purples and I am happy with the way the flowers and leaves turned out. 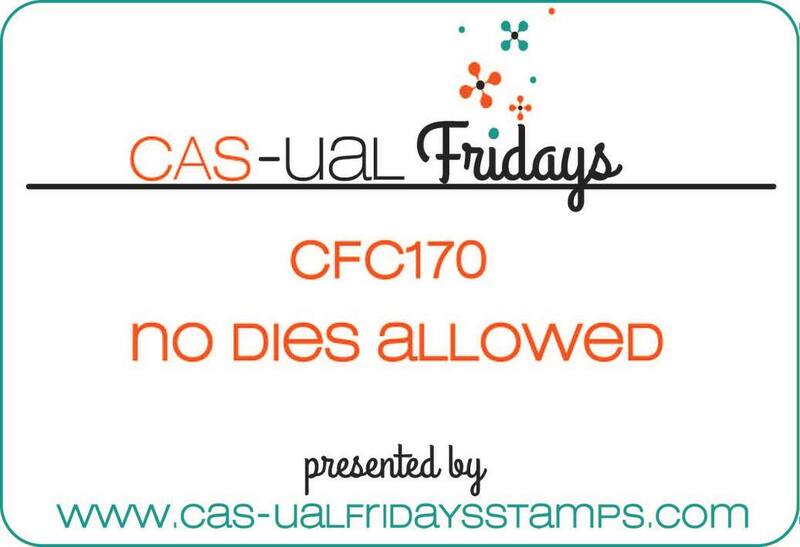 My sentiment is from the CAS-ual Friday's Wallfower stamp set and I added a mix of sequins in the same colours. I then added lavender coloured card stock as a mat in the back and angled the entire top panel to a card base and cut the excess off. 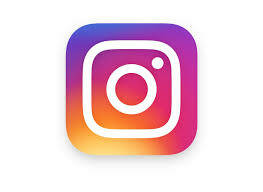 These are colours that I never use!!! I am trying to get out of my comfort zone lately and trying new things. 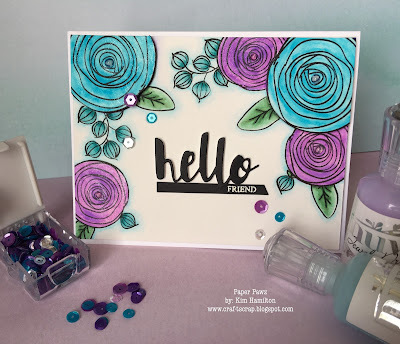 I used the Simon Says Stamp Exclusive Sketch Ranunculus stamp set with my Zig Clean Color Real Brush Markers - this set lends itself beautifully to a water based product. I die cut the Simon Says Stamp Exclusive Painted Hello die from black card stock and white embossed the "Friend" sentiment. I then added some Neat and Tangled sequins in the same colours! Happy first day of Spring crafty friends! 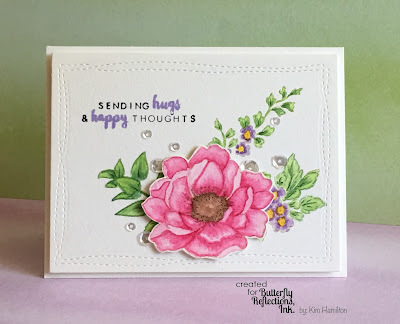 Kim with you on this Monday morning and I am sharing spring flowers with happy everything wishes with products that can be found in the Butterfly Reflections Ink shop! 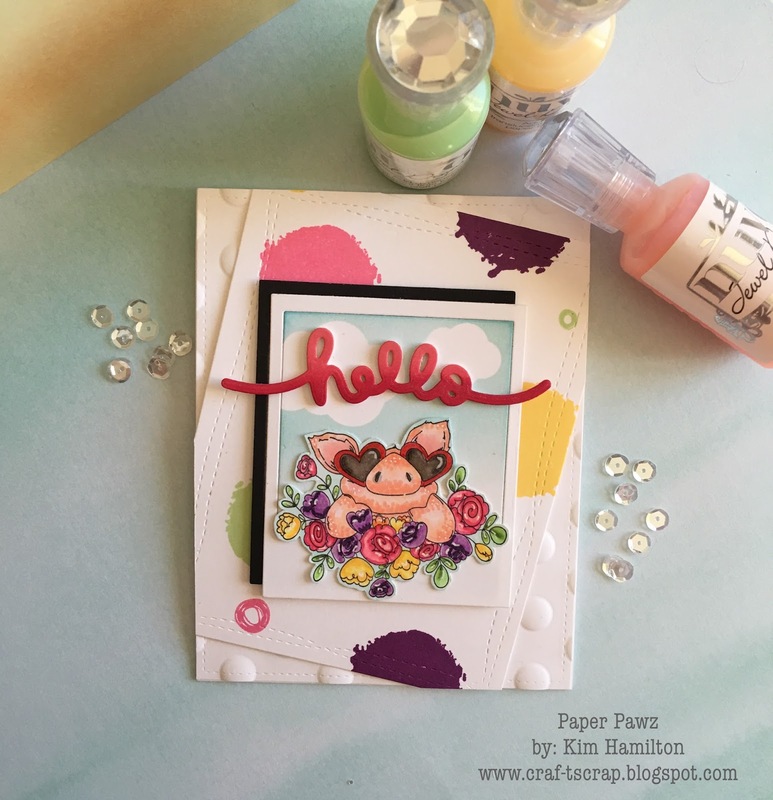 When the new Lawn Fawn release was launched, like many of you, I wanted the whole release especially the fun critters! This Fab Flowers set however is probably one of my favorite Lawn Fawn sets ever! 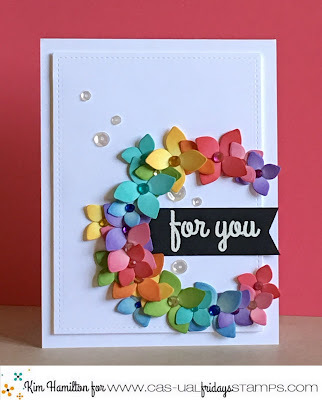 I stamped my flowers using my Misit in various Lawn Fawn and Hero Arts inks. I used LF Butter, LF Peachy Keen, LF Guava, LF Minty Fresh, LF Merman, LF Celery Stick, HA Fresh Lawn and LF Freshly Cut Grass I then die cut my images with the coordinating Fab Flowers dies. I started placing my flowers and decided to die cut two panels the yellow in the back is from the Lawn Fawn Watercolour Wishes 6x6 paper pad. I die cut both panels from the Lawn Fawn Stitched Rectangles (largest of the small rectangle set) and started placing my flowers in the bottom corner. 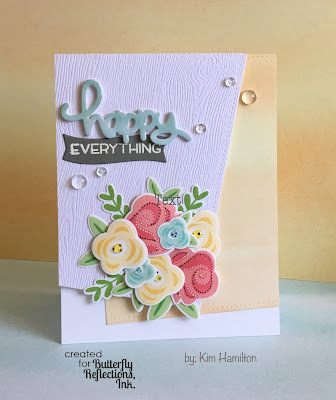 I then decided to die cut one of the three Happy, Happy, Happy Lawn Cuts and chose the "Everything" sentiment from the Lawn Fawn Happy, Happy, Happy stamp set (such a versatile sentiment set). I white embossed the sentiment on Lawn Fawn Narwal paper placed all my sentiments and finished it off with some Pretty Pink Posh Clear Droplets both the 4mm and 6mm. I added some dot detail with both my white and black gell pens. 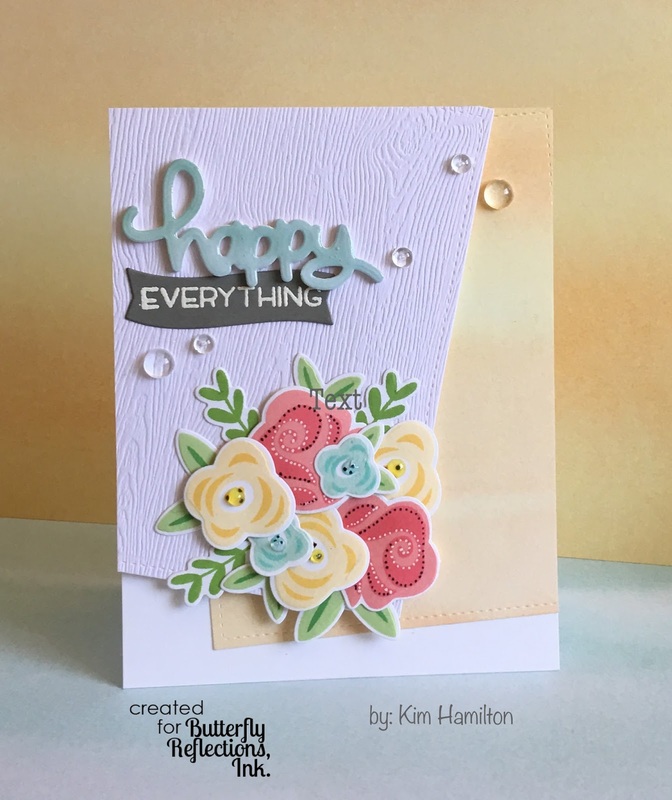 I am happy with the way this springy card turned out. Makes me happy to think we shall have flowers, grass and full-on spring soon enough! All of these products can be found in the shop, if anything is out of stock sign-up to the "notify me" in the product description. Vanessa is very quick to replenish and this helps to know what products are on wish lists! Happy Friday and mostly Happy St-Patrick's Day all! I am looking forward to a weekend with wonderful weather and hopefully the 40 cm (almost 16ft) of snow we were hit with this past Wednesday will melt away! Today's project was entirely inspired by Esther the Wonder Pig! For those of you not familiar with her story I encourage you to look-it up on YouTube or her Instagram page. She is a sweetie!!! The pig image is by Stamping Bella "Petunia is in Love" and I coloured her with my Copic markers. I then felt she really should be the star of the show so I die cut the Mama Elephant "polaroid" type photo die in both white and black card stock. I then used the Hello die by Lawn Fawn as my sentiment. I then felt that a colourful background was needed for this cutie, I pulled out my older Hero Arts brush stroke woodblock stamps and used the same colours of ink as my flowers. I then put my pieces together at an angle and that's it! 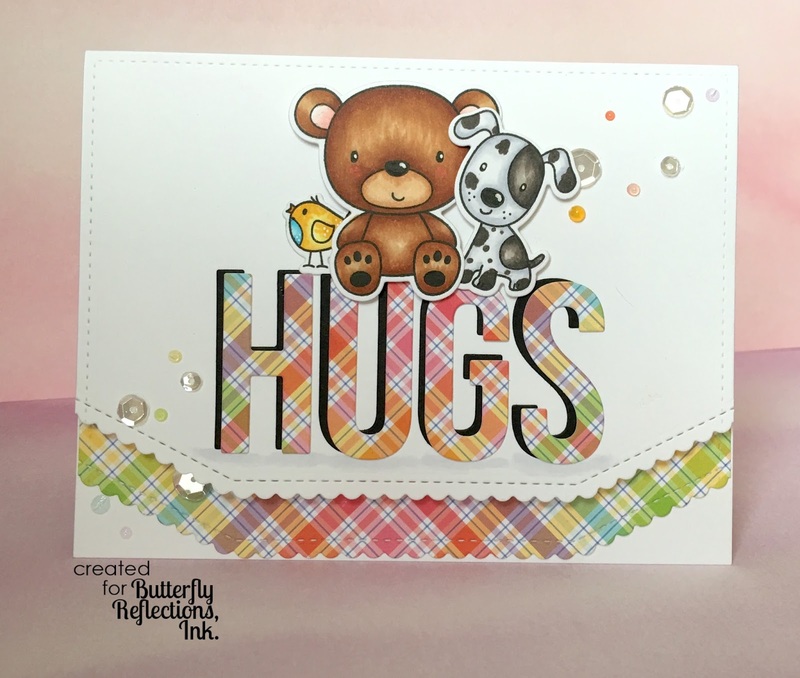 Happy Monday, Kim with you here this morning sharing a rainbow themed card featuring MFT product from the Butterfly Reflections Ink store!!! It was such cold weekend I decided to hibernate a little a find some well deserved quiet time in my craft room! 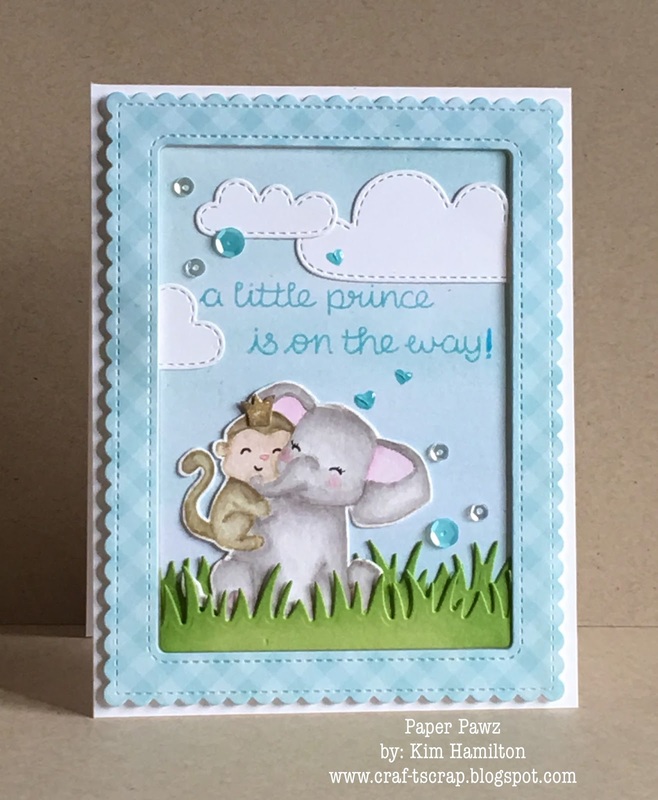 I absolutely wanted to use the Furever Friends stamp and die sets by My Favorite Things, there is just something about the MFT images that I love. After colouring my images with my Copic markers, I decided I wanted an anchor for them and what better than the My Favorite Things Die-Namics Big Hugs die! I decided to die cut it from the new Lawn Fawn Perfectly Plaid Rainbow 6x6 papers, I am so going to need to order more of this paper pack! I then decided to die cut the bottom of my base panel using the My Favorite Things Die-namics Stitched Scallop Basic Edges 2 and repeated it with some more of the same Lawn Fawn pattern paper. I put the card together and added some Pretty Pink Posh Sparkling Clear Sequins (new to the BR shop!) and a variety of the Nuvo Jewel Drops. And for today's post, I decided to offer a few different views of my project! Fri-Yay everyone!!! Woot, woot! 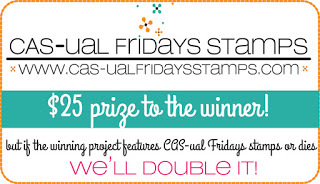 And that means time for another CAS-ual Friday's Challenge! This week we are all off the edge!! I have been in a rainbow kind of a mood lately! Longing for signs of warm weather I guess. 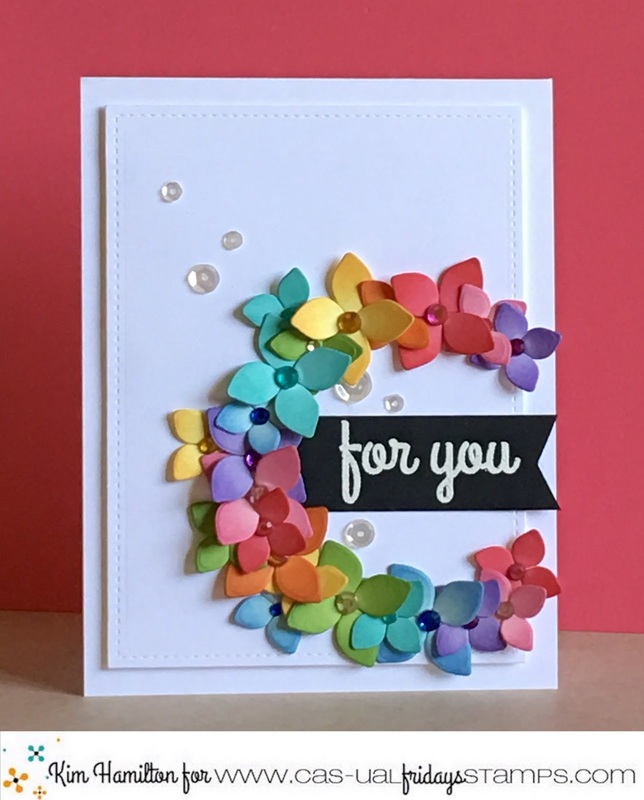 I die cut multiple CAS-ual Friday's 4-petal Fri-dies in different colored card stocks and I inked the edges in inks that were slightly deeper in color. I then arranged my 4-petal wreath in rainbow order and added matching gems to the centres. I wanted a black and white sentiment for a graphic element and went with the For You from the Bravo stamp set! And my sentiment and some of my flowers are off the edge. I toped it off with some Pretty Pink Posh sequins! Happy Monday! Kim back with you today and I am in a great mood! March has arrived which means spring is around the corner! My project today features all Lawn Fawn products and is a birthday card for one of my nephews! Go check out the Butterfly Reflections Ink shop for some great Lawn Fawn products, links below! I have always loved Lawn Fawn and especially their critters. 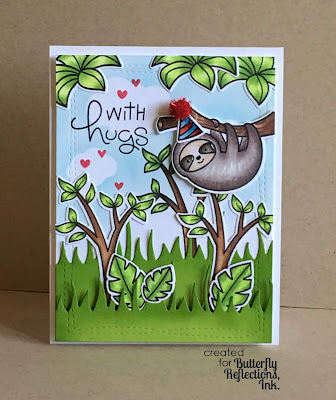 This sloth from the Hang in There stamp set is certainly not an exception - I just love him! I started by stamping and coloring my sloth with Copics (W7 and W5 for the eyes, a mix of W5, W3, E71 and E74 for the body, E40 and E42 for the face). I die cut the image then went through my Lawn Fawn stash and decided on a jungle theme for my nephew Tristan. I used the trees from Critters Down Under and the leaves from Critters in the Jungle. I then decided to die cut my base panel from Avery Elle's Wonky Stitches Elle-ments. The cloud masks were die cut from Lawn Fawn clouds and I used Distress Ink in Tumbled Glass for the sky. I also used my Copics for the trees and leaves in YG01, YG13 and YG17 and for the tree trunks I used E31, E55, E57 and E77. I then felt I needed to add some more jungle greenery and I used the Grassy Border from Lawn Fawn and added a bit of Mowed Lawn Distress Ink for depth. 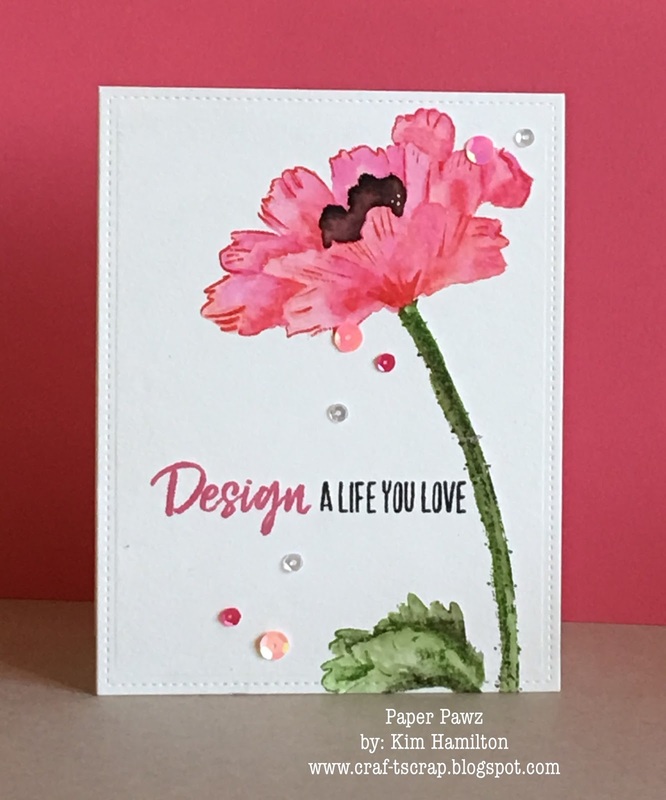 I put my card together before choosing my sentiment, I ended up loving the Lawn Fawn With Hugs from the Fab Flowers set. I added a few Lawn Fawn hearts and the birthday hat also from Hang in There and a pompom! Happy Fri-yay! I am so happy, I took a long weekend I go back to the office only Tuesday! Lots of crafty time this weekend! 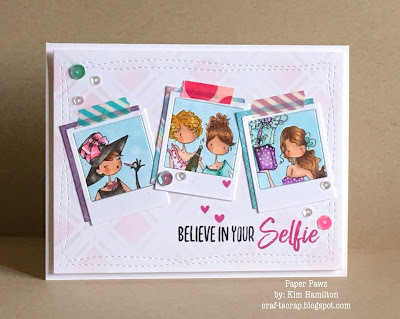 This card is a birthday card for a dear friend and when I saw that MFT set with the "believe in your selfie" sentiment I knew it was meant for her! The "Bellas" in the selfies are by Stamping Bella, I do believe the two on the right are discontinued but the Audrey Hepburn bella may still be available. I Copic colored my images and die cut them from the Mama Elephant small polaroid die. I then die cut the white frame and the backing frame from Lawn Fawn cardstock (the new Rainbow Plaid paper pack). I lightly inked my plaid stencil on the background panel and then die cut it using my go-to Wonky Stitched Rectangle die by Avery Elle. I then stamped my sentiment in Versafine onyx black and Simon Says Stamp Doll Pink. I put the frames on the base panel and added a little washy tape to the top. I added a few Lawn Fawn hearts and some sequins to finish off the card! Happy Hump Day! It is mid-day, mid week, things are looking up to the weekend! Quick project featuring Winnie and Walter today! One of my friends is expecting and she found out last week she is having a boy! The main image is from the new Winnie and Walter Big Hugs stamp set which I picked up at Butterfly Reflections Ink. I am in love with the fun critters in that set and felt that the elephant with the little monkey was perfect for a baby card :) I stamped my image with Old Paper Distress Ink on Tim Holtz Watercolor card stock for some no-line watercoloring. I then used Hickory Smoke, Pumice Stone and Frayed Burlap Distress inks for the bulk of the image and some Picked Raspberry for the cheeks and ears. I don't know about you, but I have invested so much in watercolor paints and mediums but for some reason I keep going back to Distress Inks! I die cut my pattern paper card stock from the Mama Elephant Madison Avenue large frame. The background paper is from the New Lawn Fawn Watercolour 6x6 pack and the gingham I have had in my stash for a long time (not sure about the manufacturer). I then die cut some Lawn Fawn Stitched Clouds and also used their Grassy Border dies. The sentiment is also from an older Lawn Fawn set - Hello Baby as is the crown on the monkey. I put all the elements together and used a mix of Pretty Pink Posh sequins to top off my project.